Bernie Sanders, Hillary Clinton square off: Who can "walk the walk"? On Tuesday night, the two remaining Democratic presidential candidates took turns during a televised town hall discussing what it means to be a "progressive." 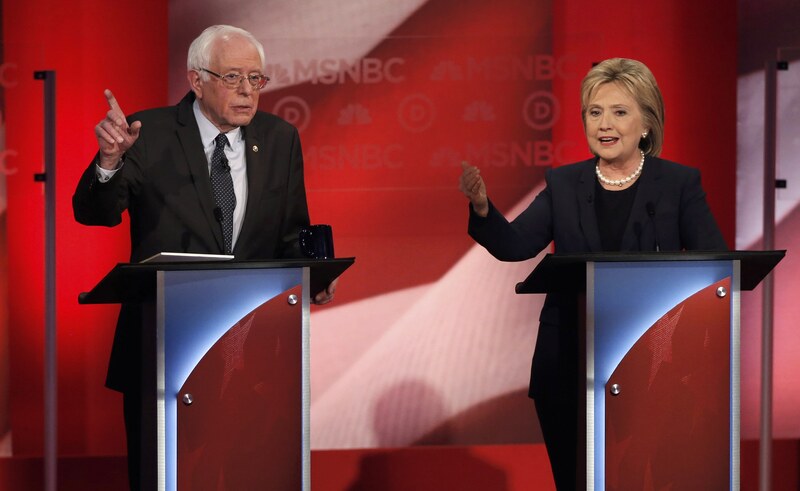 One night later on a New Hampshire debate stage, Hillary Clinton and Bernie Sanders aggressively confronted each other over who's better equipped to actually live up to the expectations of progressive voters. "One of the things we should do is not only talk the talk, but walk the walk," Sanders said in the MSNBC debate in Durham, New Hampshire. "I am very proud to be the only candidate up here who does not have a super PAC, who's not raising huge sums of money from Wall Street and special interests." Sanders won applause from the audience with that line, but he also gave Clinton the chance to turn up the heat on Sanders, turning the debate into the most contentious meeting yet of the Democratic White House hopefuls. "Time and time again, by innuendo, by insinuation, there is this attack that he is putting forth, which really comes down to -- you know, anybody who ever took donations or speaking fees from any interest group has to be bought," Clinton charged. "And I just absolutely reject that, Senator. And I really don't think these kinds of attacks by insinuation are worthy of you. And enough is enough. If you've got something to say, say it directly. But you will not find that I ever changed a view or a vote because of any donation that I ever received." She added, "I think it's time to end the very artful smear that you and your campaign have been carrying out." Sanders' anti-establishment campaign has since its inception honed in on Clinton's connections to the establishment, and particularly her ties to Wall Street. On Wednesday night, she was better prepared to defend her record as a progressive and make the case that a progressive who wants to "walk the walk" should aim for achievable goals. "Let's go down a path where we can actually tell people what we will do," she said. "A progressive is someone who makes progress. That's what I intend to do." "I also believe in affordable college, but I don't believe in free college," Clinton said, comparing her position to Sanders' proposal to make public universities free. "Every expert that I have talked to says, look, how will you ever control the costs... And of course, I believe in raising the minimum wage and equal pay for work. But the numbers just don't add up, from what Senator Sanders has been proposing." Clinton also put Sanders on the defensive over his proposal to pursue a "Medicare for all" single-payer health care plan. "There is no disagreement between us on universal coverage for health care, the disagreement is where do we start from and where do we end up," she said. "The Republicans want to repeal the Affordable Care Act, I want to improve it. I want to build on it, get the costs down, get prescription drug costs down. Senator Sanders wants us to start all over again. This was a major achievement of President Obama, of our country. It is helping people right now. I am not going to wait and have us plunge back into a contentious national debate that has very little chance of succeeding." Sanders, pointing out that he helped draft the Affordable Care Act, countered, "The idea I would dismantle health care in America while we're waiting to pass a Medicare for all is just not accurate... But by moving forward, rallying the American people, I do believe we should have health care for all." While both candidates claimed they wanted to move past the discussion of labels, Clinton at one point managed to turn the tables on Sanders on the matter of who is a true "progressive." "If we're going to get into labels, I don't think it was particularly progressive to vote against the Brady Bill five times," she said. "I don't think it was progressive to vote to give gun makers and sellers immunity. I don't think it was progressive to vote against Ted Kennedy's immigration reform." Sanders, meanwhile, lost an opportunity to put forward a progressive vision for foreign policy when asked for how much longer the U.S. should keep troops in Afghanistan. "Well, you can't simply withdraw tomorrow... and allow, you know, the Taliban or anybody else to reclaim that country," he began, then turning to the situation in Iraq. "What we must do, and what we have seen in recent months, is some progress in Iraq, where finally the Iraqi army....retook Ramadi. ISIS has lost, I think, 40 percent of the territory that it held in the last year. Hopefully, and you know, one can't predict the future, that maybe our training and their fighting capabilities are improving and we are going to make some progress in destroying ISIS." Clinton used the opportunity to highlight her experience as secretary of state. "When New Hampshire voters go on Tuesday to cast your vote, you are voting both for a president and a commander in chief," she said. "And there is no way to predict what comes in the door of that White House from day to day that can pose a threat to the United States or one of our friends and allies, and I think this is a big part of the job interview that we are all conducting with the voters here."